He then goes on to highlight two areas which he sees as of special importance. 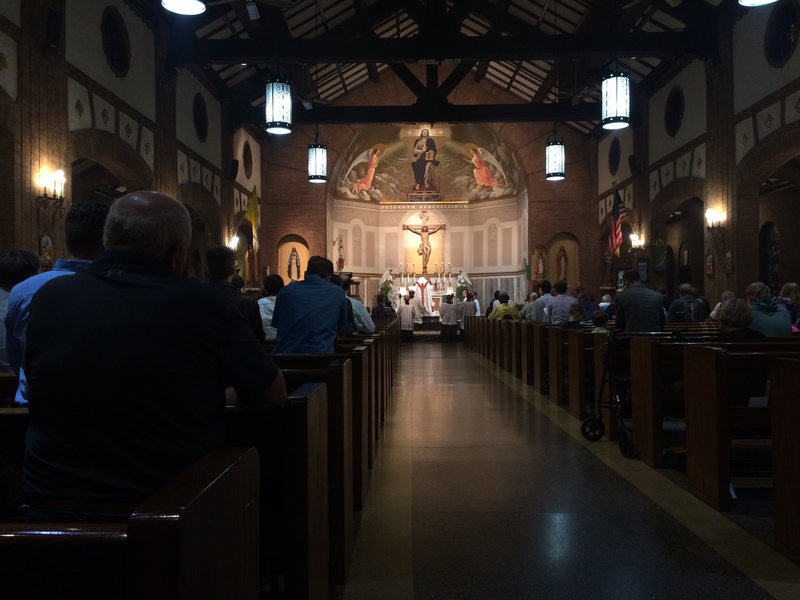 The Mass is supposed to be a source of comfort and solace. It is by the very power of the Holy Spirit that we come to understand what is really behind the liturgy. 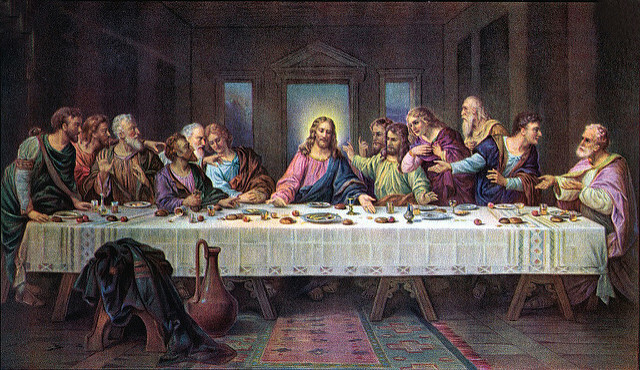 Just as Christ exposed the Apostles to it on Holy Thursday and ratified it on Good Friday, we are able to witness that same truth, in an unbloody way, every time we assist at Mass. Fr. Kocik’s words are very poignant, as are the two cardinals. The message is consistent and the message is clear, from the top down. We must guard the sacred treasury of the liturgical action. We must not give in to our emotions and our own whims, but rather we must do that which the Church asks of each of us. “Art and Environment” as defined in 1978 is not what the Church intended. No friends, the Church was clear in her message from Vatican Council II. Do what the Church intends, not what the individual intends. This is never more clear than in the paragraph from Sacrosanctum Concilium no. 22. “Regulation of the sacred liturgy depends solely on the authority of the Church, that is, on the Apostolic See and, as laws may determine, on the bishop. The last sentence is the kingpin. We don’t have the authority to innovate. Do what the Church asks. The Pope is the first legislator of the law of the Church, therefore, the reforms that Pope Emeritus Benedict enacted are in keeping with the authentic spirit of Vatican Council II. And it is ratified by both Pope Francis and Cardinal Sarah. Frivolous and unnecessary actions should be avoided and we should strive to return to the the notion of noble simplicity. 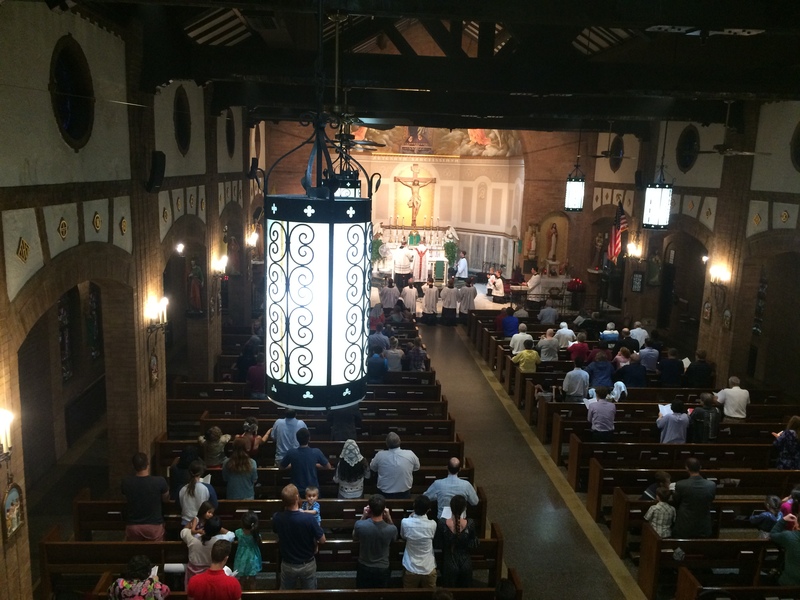 Holy Mass is not a place for experimentation or deviation from the norm. We should revel in the beauty that the Church offers us, by her timeless treasure. This is the mentality of today. We do not live in 1970s and 80s any longer. 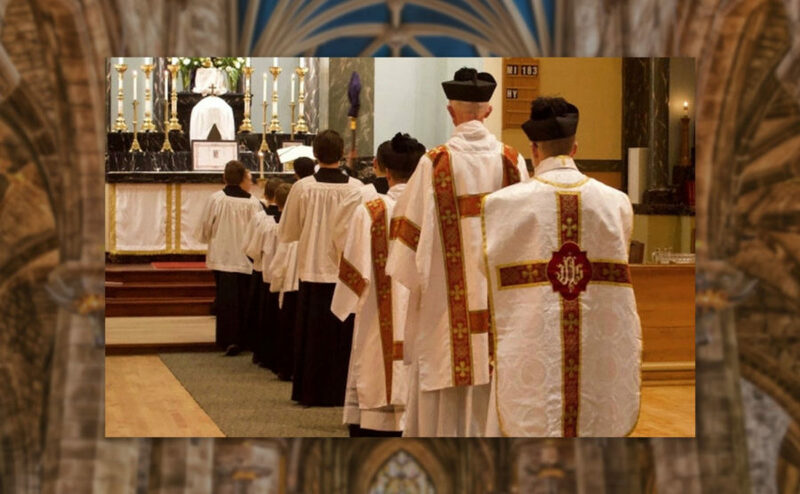 We live in a time in which we must not be influenced by the immediate reaction to the loosening of the liturgy, for as we see, this never was the case. Then-Cardinal Ratzinger was ahead of his time, at odds with the proponents of “Art and Environment” and called for a renewal, not a reworking. And that is the mentality with which we should approach Holy Mass. Not an exaggerated sense of the surroundings, but a noble simplicity of form and function which extols the beauty of the Mass from all time. Any other activity is purely ancillary to this primary purpose. That so many Catholics emphasize external actions — rather than interior union with the Eucharistic sacrifice — as the essence of participation, is in Benedict’s view a sign that “liturgical education today, of both priests and laity, is deficient to a deplorable extent.” We must orient our minds and actions to God. In doing so, we should look to that which is the most beautiful thing we can give, whether it be precious vestments, or beautiful vessels, or the most appropriate singing. 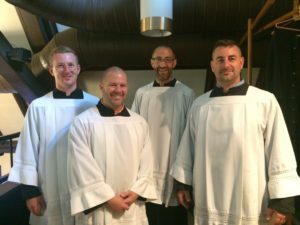 Andy Milam is the Coordinator of Public Relations, Marketing, Fundraising and Tourism at the ‎Shrine of the Grotto of the Redemption, an active member of the Knights of Columbus, and the Liturgical Coordinator for Una Voce Des Moines. Ember Days occur four times a year, corresponding to the four seasons. The winter Ember Days occur on the Wednesday, Friday, and Saturday following the Feast of St. Lucy on December 13. The Spring Ember Days follow Ash Wednesday. 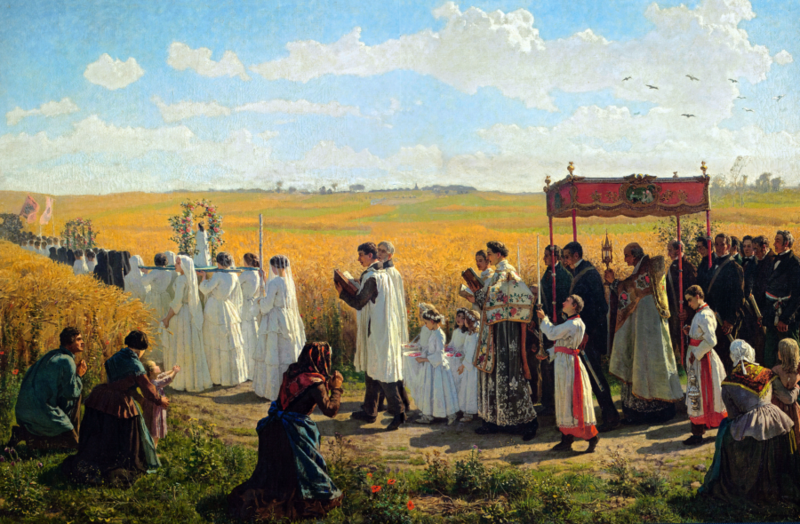 The Fall Ember Days follow the Feast of the Exultation of the Holy Cross on September 14. The Summer Ember Days follow Pentecost. “Spring is warm and humid, summer hot and dry, autumn cool and dry, winter cold and wet. Therefore we fast in the spring to control the harmful fluid of voluptuousness in us; in summer, to allay the noxious heat of avarice; in autumn, to temper the aridity of pride; in winter, to overcome the coldness of malice and lack of faith.” Jacobus de Voragine, The Golden Legend. The Code of Canon Law of 1983 no longer requires the observance of the Ember Days fast, and the reform of the Roman Calendar in 1969 left them to the discretion of local ordinaries. 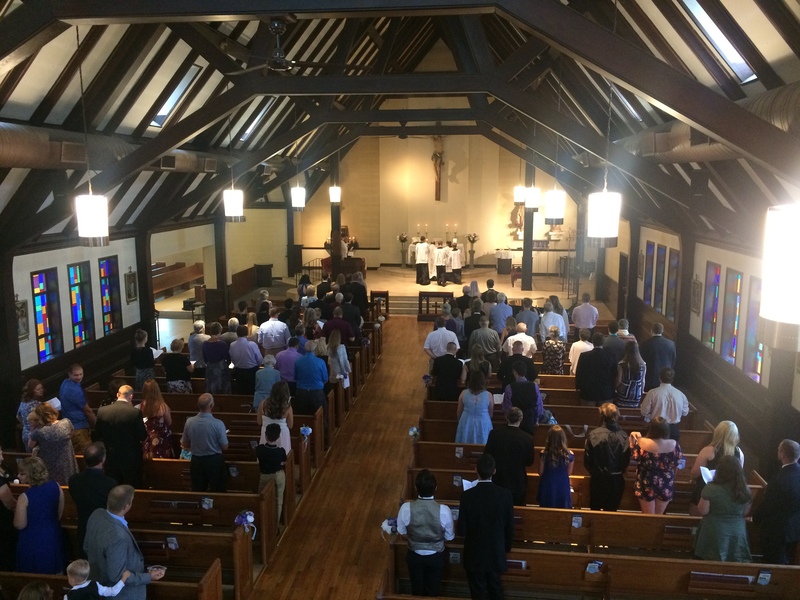 Nevertheless, personal observance of Ember Days in Catholic homes, especially in an agricultural state like Iowa, helps to connect us with the rich liturgical tradition of the Church. Some years ago, I read an article in a Catholic publication by a priest who describes himself as “liberal.” He had finally responded to the request of some of his parishioners to celebrate the Extraordinary Form. Isn’t that how we should be approaching Holy Mass, whatever form we are assisting at, whether it be the Ordinary Form or the Extraordinary Form? We should not look to the priest to entertain us or to captivate us. We should not look to the priest to preside over us. Follows the rubrics as prescribed. We can be assured then that Father Celebrant is doing the will of God and ministering to us as he is ordained to do. Vatican Council II speaks to us about the importance of silence. The Popes since Vatican Council II have reiterated the importance of knowing what our role should be and how to best commune with God, the Father. We need to open our hearts and minds and souls to that action. We need not feel that we must *do* something at Holy Mass (some extraordinary ministry)….but rather we must *be* at Holy Mass to worship. Once Father understood what it was that he was called to do, he wasn’t afraid of or discouraged by the Extraordinary Form any longer, but rather, he was opened to a whole new world of ministering which he had refused to participate in, previously. 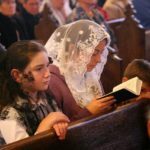 We, as faithful Catholics, need to understand that a Mass which existed for more than 400 years as the only normative vehicle for the confection of the Eucharist can do no one harm or lessen their Catholicity. And isn’t becoming a better Catholic, more in tuned with our Catholicity, what we’re really after? Much of what is written below comes directly from The Catechism Explained: An Exhaustive Explanation of the Catholic Religion by Rev. Francis Spirago. The Latin language is venerable on account of its origin and its antiquity; indeed, it dates back to the earliest centuries of the Church and to the very masses offered in the obscurity of the Catacombs. There is an element of mystery about Latin. It is a [static] language, not spoken by the faithful. The use of Latin conveys to the mind of the people that something is going on upon the altar which is beyond their comprehension; that a mystery is being enacted. 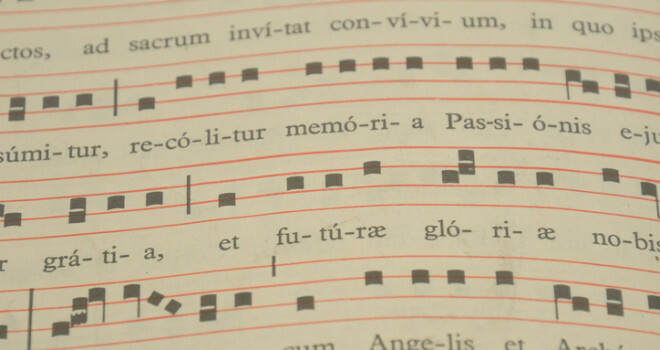 Latin is a liturgical language for Catholics. It is a striking fact that both Jews and pagans made use, in their worship of the Deity, of a language with which the multitude were not conversant. The Jews in fact made use of Hebrew, the language of the patriarchs; we did not see Our Lord or the apostles censuring this practice. The use of Latin in the Mass is a means of maintaining unity in the Catholic Church, for the use of one and the same language in Latin Rite churches all over the world is a connecting link to Rome, as well as between nations separated by their cultures and native tongues. 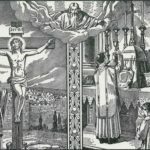 The primary reason why the whole of the Mass was historically offered in Latin is because it is a sacrifice, not an instruction for the people. The celebration of Mass consists more in action than in words. This final reason cannot be overstated. 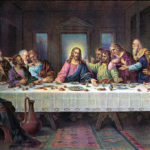 A Protestant gathering which commemorates the Lord’s Supper is simply a service of prayers and instruction. For this reason the vernacular is a necessity. 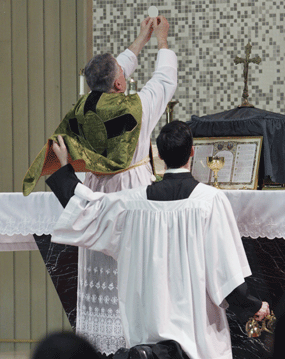 The Catholic Mass, however, is a holy sacrifice offered to God the Father by an ordained priest, in persona Christi. 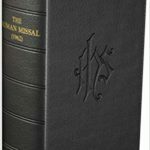 The action of the Mass, and the mystery of it, is reinforced by the use of Latin. American-born Benedictine monk, Fr. Cassian Folsom, O.S.B., prior emeritus of the Monks of Norcia, was in town the weekend of June 23/24 to celebrate Sunday Mass at St. Anthony’s Catholic Church. 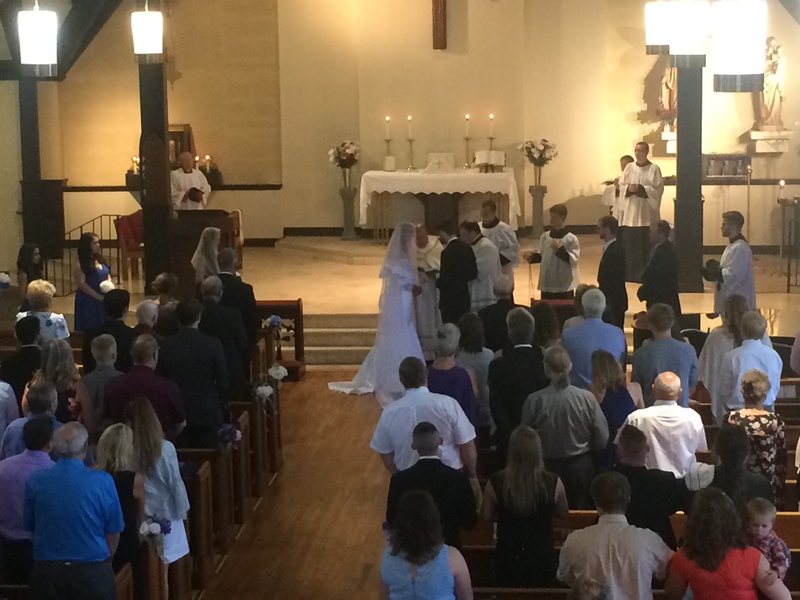 Here are some photos, and his beautiful homily for the occasion. 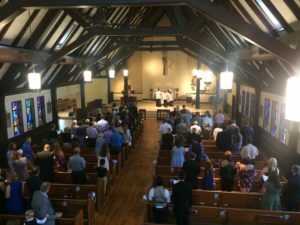 Homily from Fr. Cassian Folsom, O.S.B. [t]aken up by Christ – and taken on Christ – we are not the same after the laver of baptism as we were before; instead the body of the one reborn becomes the flesh of the crucified (St. Leo, Sermon 63,6). John baptizes, and the body of Christ is washed, both Head and members. What then will this child be? He will be a prophet, the prophet of the Most High. Who is “the Most High”, but God the Father? Yet, John is a prophet of the Messiah. And who is the Messiah, but God the Son, our Lord Jesus Christ. And can John be a prophet of God the Father and God the Son? Well, our Lord explains in Gospel: The Father and I are one. John is a prophet of the Most Holy Trinity because in the baptism of Christ, the Holy Spirit descends upon him in bodily form as a dove, and the paternal voice came from heaven: “Thou art my beloved Son, with thee I am well pleased” (Lk 3:22). If John is a prophet of the Most High, we the baptized are worshipers of the Most High. The Roman Canon prays for “omnibus cultoribus”: for all right-believing worshipers of the catholic and apostolic faith. Our first duty as baptized Catholics, our greatest privilege, our highest calling – is to be worshipers of God, adorers of the Most High. And in doing so, we prostrate ourselves before the Divine Majesty, imitating the angels and the saints. John is a prophet of the Most High; we must be right-believing worshipers of the Most High God. I have fought the good fight; I have finished the race. I have kept the faith. Henceforth there is laid up for me the crown of righteousness which the Lord will award to me on that Day (2 Tim 4:7-8). John is the forerunner, Christ is the giant who runs his course; we must be formed as athletes of Christ, well-trained to run the glorious race. He who has the bride is the bridegroom; the friend of the bridegroom, who stands and hears him, rejoices greatly at the bridegroom’s voice, therefore this joy of mine is now full (Jn 3:29). We who have been baptized are “children of the wedding feast”. In one of the parables, Christ says: “Can you make wedding guests fast while the bridegroom is with them?” The Greek for “wedding guests” is “children of the wedding feast”. Children of the bridegroom and the bride, for we are born of the virginal womb of the church, the baptismal font. The bridegroom is Son of God by nature; the children of the bridegroom are sons by adoption – Filii in Filio – sons in the Son. As we grow in the faith, we become not only children, but friends, for Christ said: “I have called you friends”. 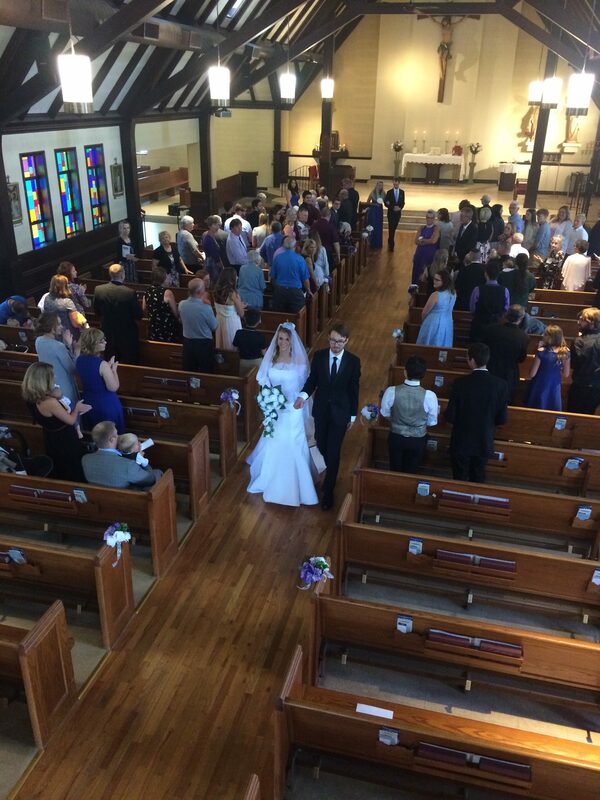 John is the friend of the bridegroom, Christ is the bridegroom; and we are children of the wedding feast. So, what will this child be then? He is the voice of one crying in the wilderness. He is the voice, but Christ is the Word. We, the baptized, are the Ear that listens to the Word. St. Benedict begins the Rule by saying “Listen, my son, to the precepts of the Master, and incline the ear of your heart” (Prologue 1). What does the voice say to the ear of our heart, except “He must increase, I must decrease” (Jn 3:30). Here is a summary of the entire Christian life. Our life project, you might say. Love of God must increase; love of self must decrease. Humility must increase; pride must decrease. The new man must be born and grown; the old man must fade away and die. Even the natural elements preach the same Gospel message to us. For from the summer solstice, from the Birth of St. John the Baptist, the days begin to decrease. From the winter solstice, the Nativity of our Lord, the days begin to increase. Most Catholics in the world would love to grow in their relationship with Our Lord. People have a genuine desire to grow in holiness, even if they are not able to articulate their desires for it. On New Year’s Day many people re-evaluate their lives. They examine how their lives were and make resolutions about how the next year can be the best year! Weight loss and eating right will top people’s lists. But why not make some spiritual resolutions as well? 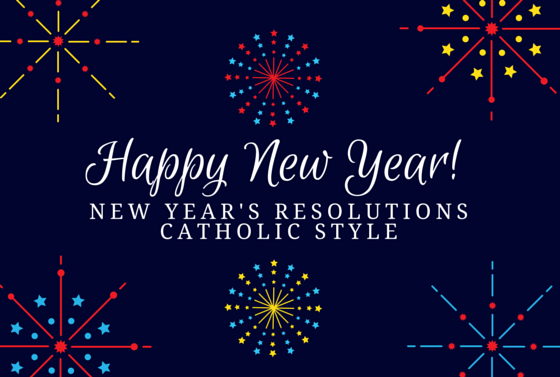 Examine how your spiritual life has been and make some sort of resolution starting today. It’s never too late, even if we’re starting in July! If there is a saint that you have been fond of, why not learn more about them this year? Ask for their intercession daily. Want a random saint? The internet is full of stories about the lives of obscure saints! You are bound to find one! Want to know who a patron saint is of something? Google it. Saints are our friends in heaven who pray for us. For me, I’ve dedicated the year to St. Josemaria Escriva and the Venerable Fulton J. Sheen. There are many books out there that promote reading the whole bible in a year. Those readings are really long for each day—averaging 20 minutes. Maybe you don’t have time for that much reading. Why not dust off your bible, and begin reading the Gospels? You could start with Matthew, but don’t become discouraged with the genealogy of Jesus! I promise you it gets better! Choose one of the four gospels and read small excerpts each day. The RSV-CE has headings of stories (called pericopes). Read a small snippet, 5-10 verses a day. You will learn more about Our Lord, and you will come into contact with the living Word of God. Many people want to have a stronger devotion to Mary. Maybe 20 minutes of praying the rosary is a lot of time. (You could pray in your car with a rosary cd or rosary app). Some people find five decades to be a lot! Why not pray a decade a day? In five days’ time you will have completed one set of mysteries. Then begin again. There is power in the Hail Mary prayer — each time we ask Mary to pray for us “now and at the hour of death”. I don’t know about you, but I need the Madonna’s prayers right now, and especially at death. If the rosary doesn’t appeal to you, there are many other Marian devotions. The Angelus is quite simple and can be prayed once a day or three times (breakfast, lunch, and dinner). Find the Marian devotion that suits you and go with it. There are treasuries of spiritual books out there and reading a small portion for five minutes a day can be of great benefit. St. Therese of Lisieux’s Story of a Soul is a favorite for many! Maybe you are attracted to the Divine Mercy devotion, and would like to read the Diary of Faustina. The saints have written many books that will surely lift you up. Spiritual masters note that when we do not do spiritual reading, our spiritual lives begin to lag. Pick up a book today! Lighthouse Catholic Media produces many CDs about the Catholic life. Many parishes (including St. Anthony’s!) make these CDs available in their vestibules for a small donation. Consider listening to a CD each month. Lighthouse Catholic Media makes this easy by offering a small monthly subscription service. Listening to these CDs will bring you to a greater understanding of your Catholic faith. In addition to CDs, most cities throughout the US have Catholic Radio, be it Iowa Catholic Radio, Relevant Radio, Radio Maria or EWTN Radio. 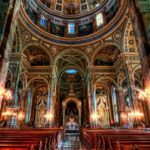 Take a listen and you will see how adding a Catholic culture to your life will make a positive difference. As a young person, you might have prayed simple, catchy prayers before meals. Each of us should be grateful when we sit down for a meal because there are many in the world who go hungry each day. If you don’t regularly express gratitude to God for the food you have received, consider starting. When we give thanks before and after meals we cultivate an attitude of gratitude which will pervade beyond the food we eat into every aspect of our lives. Before we go to Confession, it is recommended that we examine our consciences. Many pamphlets exist that help us to do this. One spiritual practice employed by some is a nightly examination of conscience. In addition to calling to mind one’s failings of the day, a person also recalls the blessings of the day — how God was at work in their life. Consider pausing each night before bed, and reflecting on the movements of your day. Be thankful. Be contrite. Ask God for help in whatever tomorrow will bring. In addition to our physical health conscious goals, we must also be conscious of our spiritual life when making our annual resolutions. 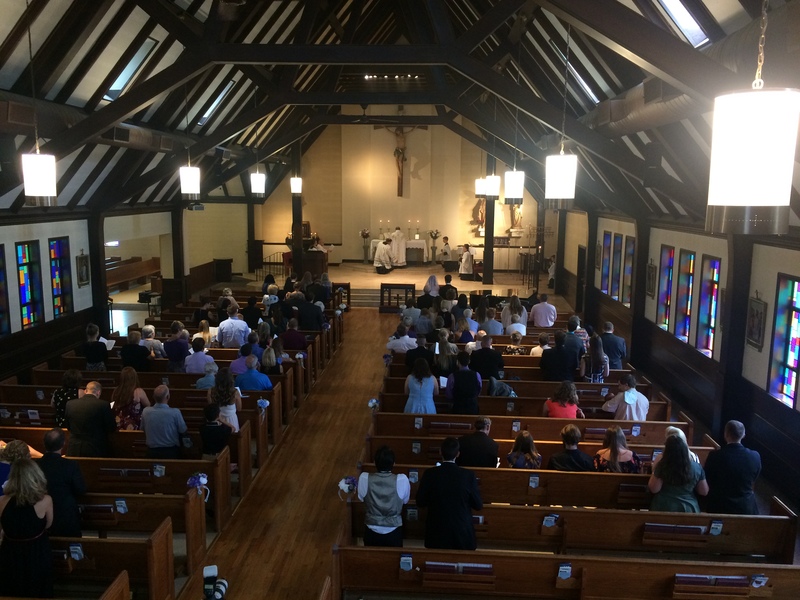 There are many other suggestions — like going to a daily Mass once a week, frequenting Confession once a month, etc. The remainder of this year can be a time to grow in holiness. It begins with a simple goal and not biting off more than you can chew. Together, let us all strive to love the Lord more each day this year by putting Him at the center of our life. 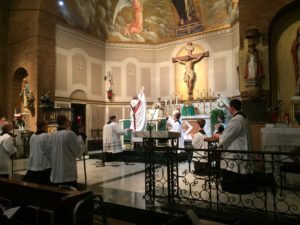 Last year, my family accepted a challenge: attend the Tridentine Mass for eight consecutive weeks. The challenge came from a podcast from Fr. 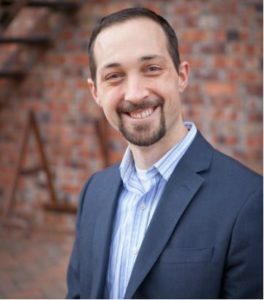 Chad Ripperger, who proposes that when it comes to liturgy, an invitation can be more efficacious than an argument: instead of telling we should show. Fr. 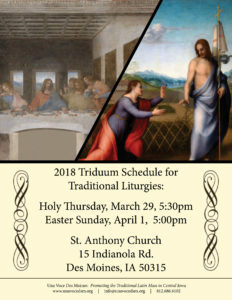 Ripperger advises that we invite a person to attend the Tridentine Mass for eight consecutive weeks, then have him or her return to the Novus Ordo to reflect on the differences. Our sensibilities and dispositions change as we develop new habits and routines; three to eight weeks is a good measure of how long it may take to build a new habit. One may ask: why it’s important to change our sensibilities? 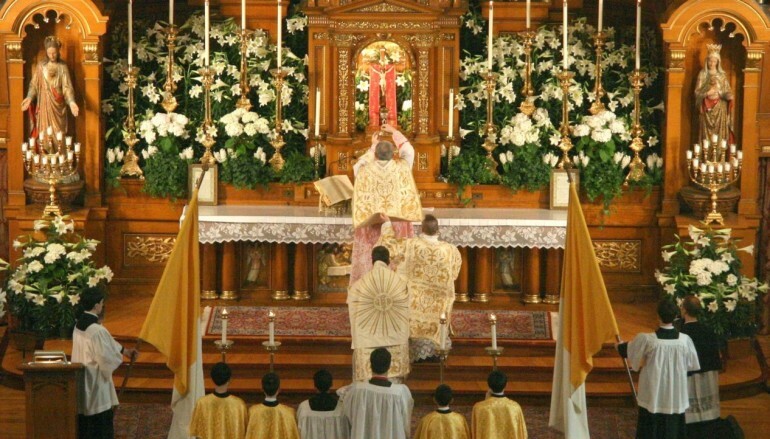 I believe what often turns people away from the Tridentine Mass has nothing to do with a lack of intellectual formation, and everything to do with the formation of senses. Or rather, how one is inclined towards sensible objects: what attracts or repels us. 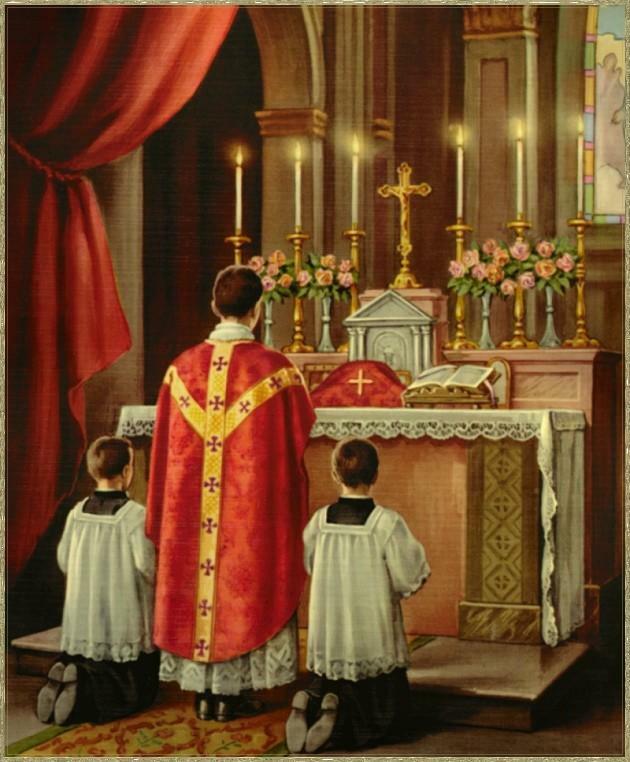 Prior to the challenge, my family and I had attended the Tridentine Mass on a handful of occasions, but never consistently. Honestly, each time I went, I felt lost and confused, not knowing what to do or say next. 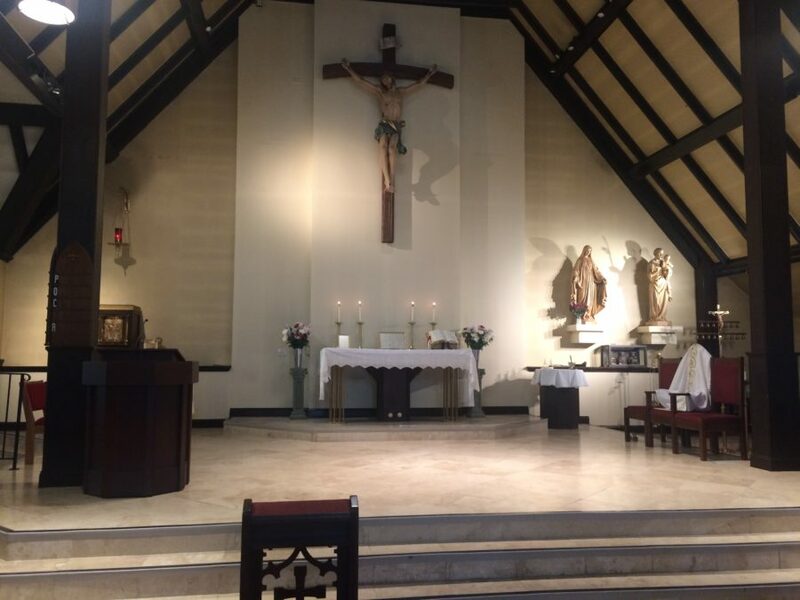 My senses had difficulty apprehending: the prolonged periods of silence, the whispered prayers by the priest at the foot of the altar, the sounds of chanting coming from the schola, attending to an unknown language; the list could go on. I would then return to the Novus Ordo and my senses would welcome the familiarity. During the eight week challenge, there was no returning. For about two weeks, the same experience surfaced: not knowing how to participate, not knowing what part of the Mass the priest was saying, and not knowing how to respond. The turning point in helping me recognize a fundamental aspect to the eight week challenge was the idea of passive participation. We have to be receptive in order to allow our sensibilities to be changed. 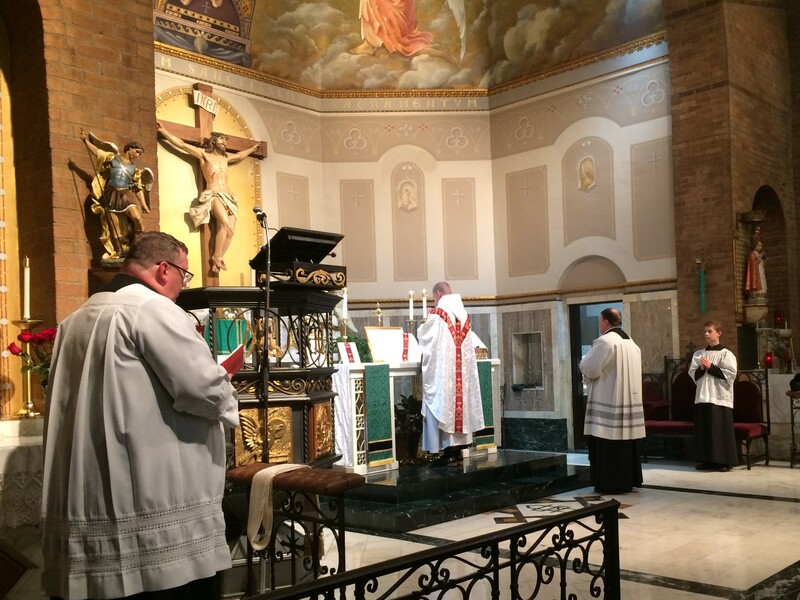 During the first two weeks, I was imposing the familiar onto the new, the Novus Ordo onto the Tridentine Mass. In other words, I was too focused on what to do; being overly concerned with a more active participation. By adopting a passive mindset, it allowed my senses to also become passive, as they naturally should be. Our senses receive reality, they don’t impose on it. 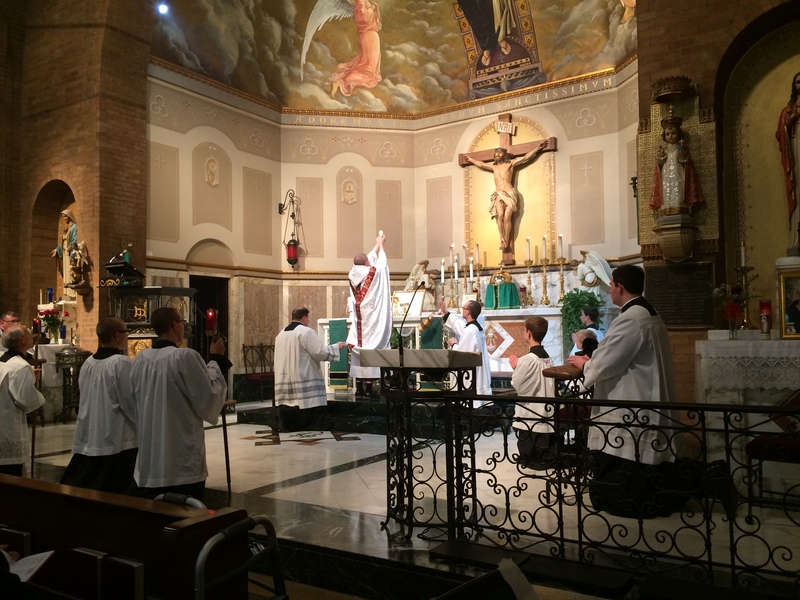 As each week progressed, parts of the Mass became familiar. More importantly, my experience attending Mass in general changed; my participation was to *rest* in the Mass, instead of acting in the Mass. As a result, there was a natural adoption of learning the responses and identifying and recognizing the parts of the liturgy; just as a child naturally develops a language just by being receptive. Fr. Ripperger asks, once completing the challenge, to reflect upon the Tridentine Mass and the Novus Ordo and notice the differences. The dispositions I developed during the challenge instilled in me an attraction towards sacred silence and mystery. 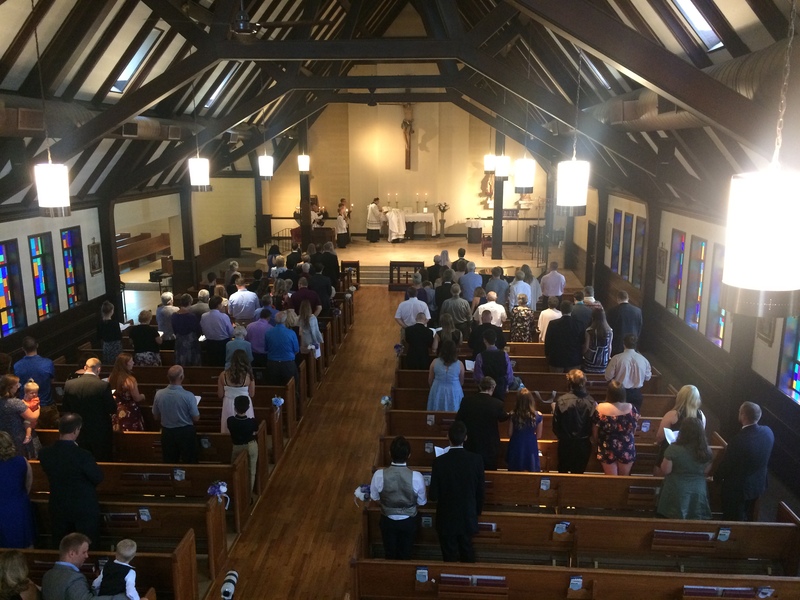 What once caused confusion and feeling lost, instead was now bringing me deeper into the Mass. Now that the challenge is over, my senses do not find the Novus Ordo as ‘familiar’ as they once did. Dr. Kevin Kilcawley is a clinical psychologist and founder of Integrative Psychology Services. He seeks to improve the practice of modern psychology with a holistic and Thomistic understanding of the human person, where mental health means more than just the absence of symptoms – it is a life engaged in what is true, good and beautiful. Looking for some Traditional Liturgies during the Triduum?